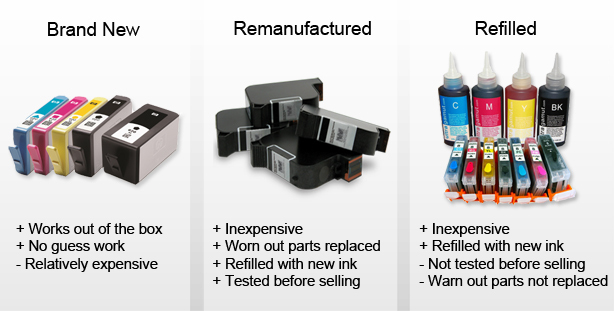 There are three types of compatible ink and toner cartridges Brand New, Remanufactured and Refilled cartridges. Remanufactured Cartridges are thoroughly inspected and all worn parts are replaced with third party compatible parts. All Remanufactured cartridges are tested after being refilled. On the other hand, Refilled cartridges are refilled without testing and worn parts are not replaced. i-Market believes in providing the best and most reliable supplies which is why we sell Brand New and Remanufactured cartridges only. Our ink and toner carry a 30-Day Money Back Guarantee and a 1-Year Manufacturer Warranty.